So, finally John McCain got his town hall format he so much looked forward to and I think most everybody will agree, it worked very well ….. for Barack Obama. John McCain did okay enough for himself (if you discount some of his answers), but he was no match, again, for a cool, calm and collected Barack Obama. The contrast couldn’t have been more stark: A steady, knowledgeable, likable guy on stage with a grumpy old man. AND WE LIKE TO ELECT THE LIKABLE GUY! If I had the opportunity to ask McCain one question after the election, I would like to know the reason for his obvious disdain for Obama which showed when he wasn’t able to look at Obama once in the first debate, to being condescending to him in both, to not using Obama’s name once in this debate, but instead referring to him as ‘That One’. Is this disdain for Obama rooted in not liking the idea to share the same stage with him, or is it deeper and personal? As McCain often points out, he is not ‘Miss Congeniality’! Well, it shows! It was also telling that McCain left right after the debate while Obama and his wife interacted with the people for a long time afterwards. Bottom line: Again, everybody can be very reassured that Barack Obama has the temperament and intellect (and the ‘steady hand at the tiller’ McCain repeatedly referred to) to be president in these perilous times. 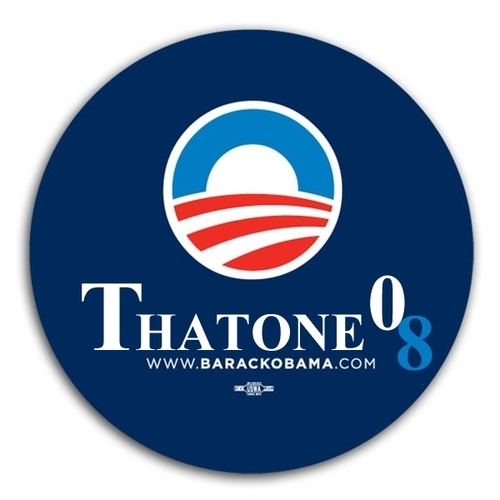 I love that image of the “that one 08” button. can you email it to me? I have to agree he doesn’t uses Obama’s first name nor can he use the word middle class. So funny, here comes MACACA!! !